Big news! 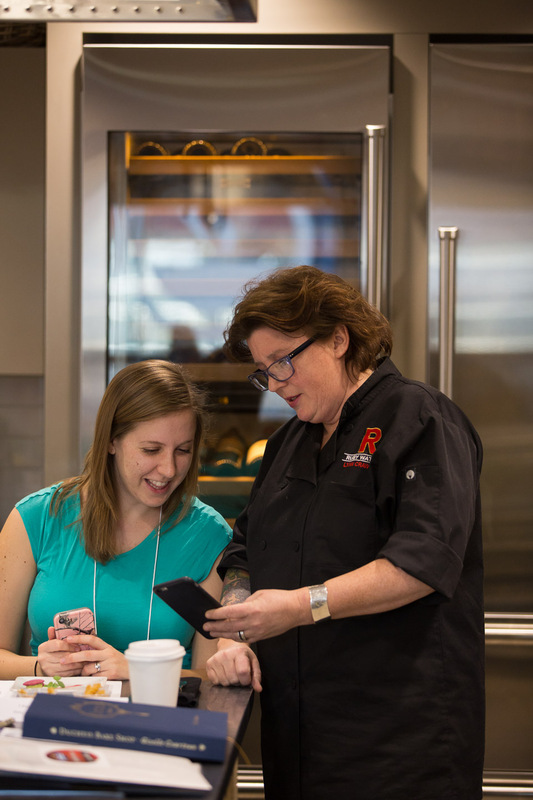 I got to meet chef Lynn Crawford!! I know, right?! 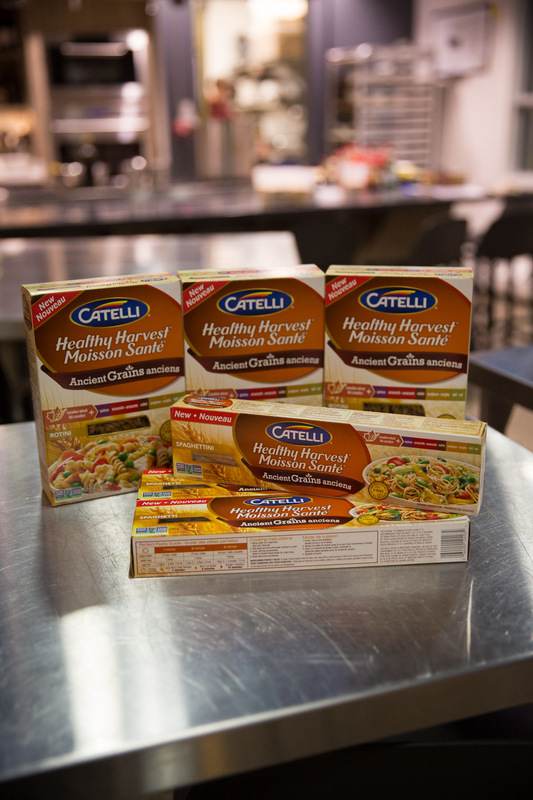 I was so lucky to have been invited to a promo event launching Catteli’s new Healthy Harvest Ancient Grains Pasta. Chef Lynn was honestly hilarious. You can tell that she is truly an entertainer as well as an extremely talented chef. We were all so lucky to get to have such an intimate experience with her. I also got the chance to pop some soghum. 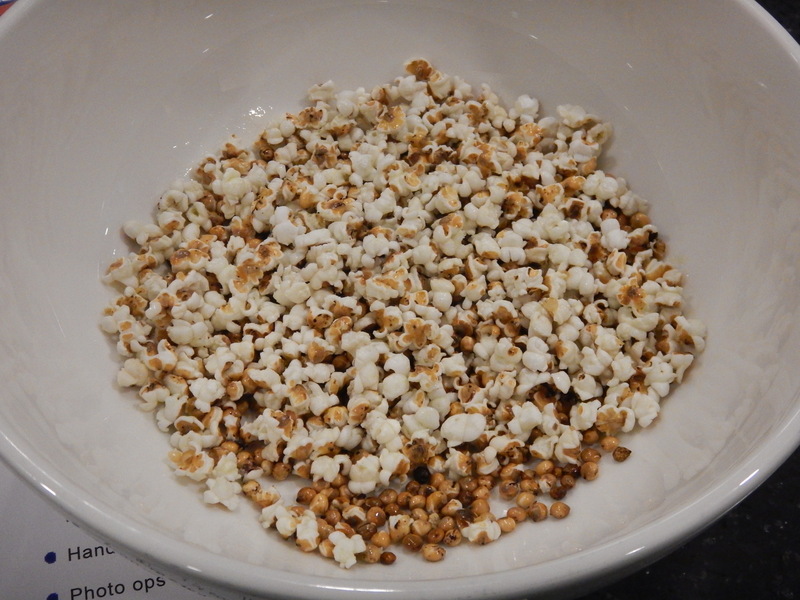 (Did you know that you can pop ancient grains?). When popped, it tastes a little nuttier than popcorn. It was delicious. I am definitely going to do this with some of Gold Forrest Grain’s Farro! Chef Lynn made us her famous marinara sauce to go along with the rotini pasta. I am not exaggerating when I say that it was the best marinara I have ever tasted. I am definitely following her recipe next time. 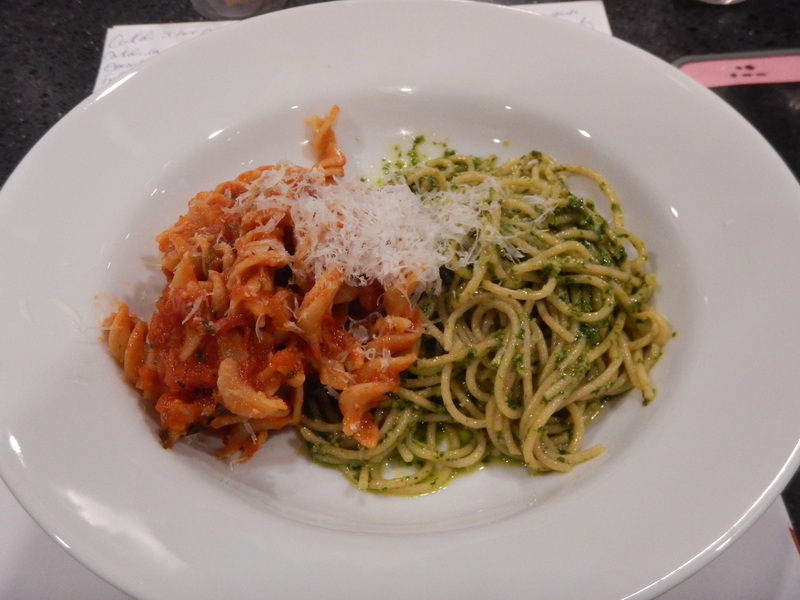 We also made a quick pesto to go along with the spaghetti. Both were so delicious! Now let me tell you a little bit about the pasta: It combines Canadian grown amaranth, quinoa, teff, sorghum, and millet. The pasta has a bit of a different texture from regular whole wheat pasta. While it is still toothy, it’s not chewy like whole wheat pasta. That’s something I hate about whole wheat pasta so I rarely buy it. This pasta is definitely being added to my list! 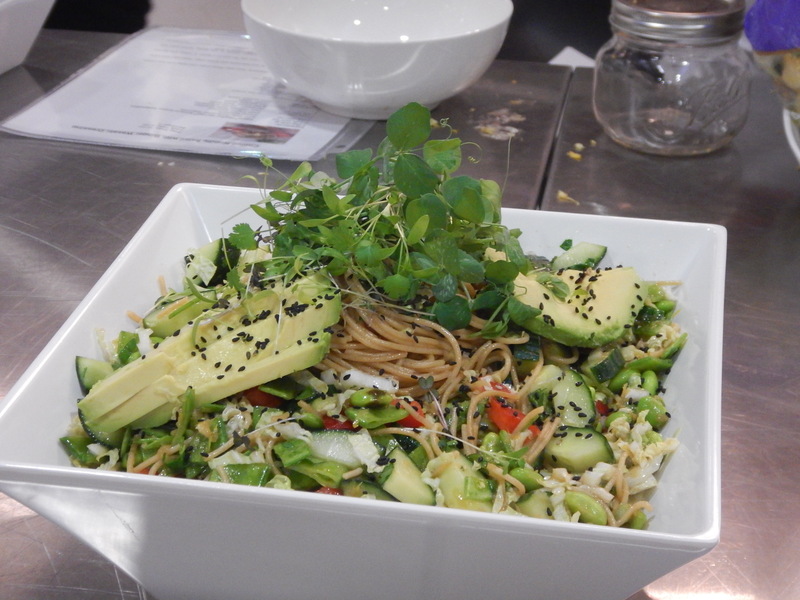 For the main event, we all got to make Chef Lynn’s incredible chilled noodle salad with ginger wasabi dressing. It was chock full of veggies and when I brought it to work the next day for lunch, I couldn’t help but brag that my lunch was made by a food network star! 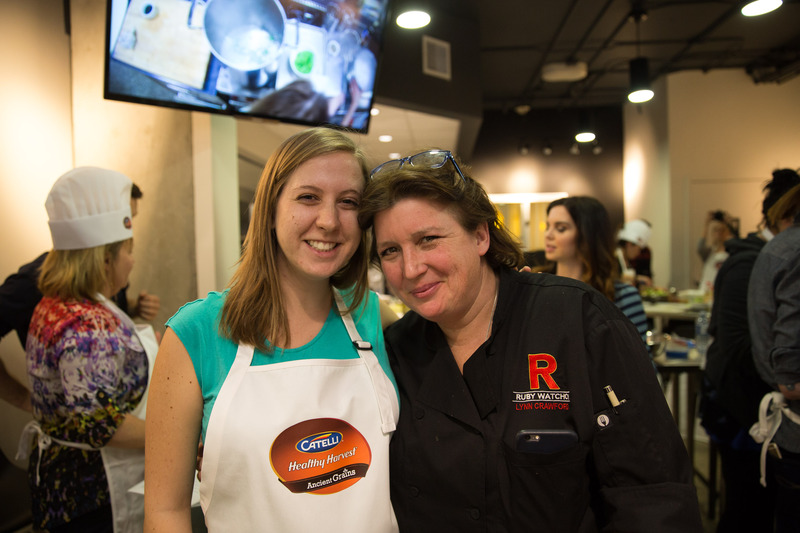 I had a blast meeting Chef Lynn. She truly is wonderful person. I have to say, since getting pregnant, my relationship with food has seriously changed. One week, I can’t get enough of something, and the next week, I am so disgusted by it that I can’t even be around the smell of it cooking. It makes choosing tasty, healthy choices quite the challenge. I’ve had an aversion to cooked vegetables for a few weeks now, so I keep trying to incorporate different veggies into my diet gradually. I started off by choosing my favourite pizza toppings. Then dicing them up nice and thin. 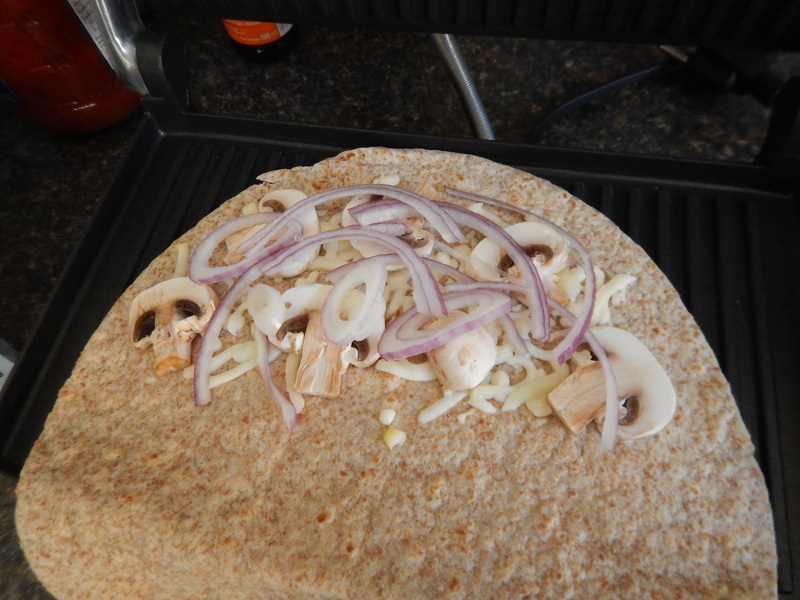 Next, begin layering them on your tortilla. Start with cheese, then add your veggies. 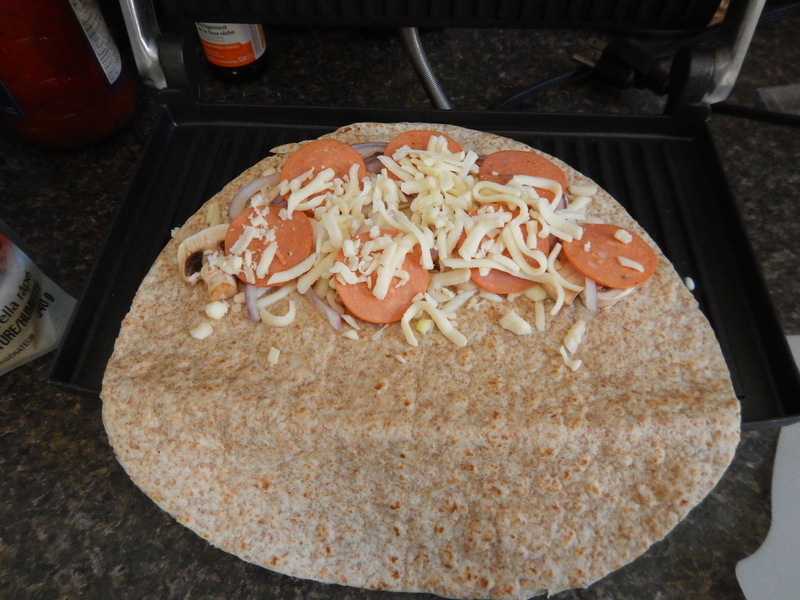 Then add your peperoni and more cheese, to hold it all together. 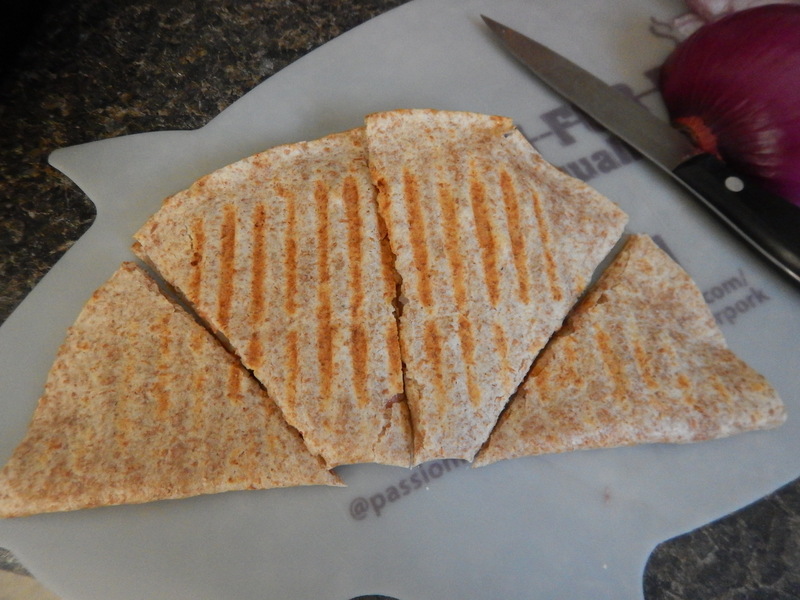 I like to use my panini press when making quesadillas. I find it gives all the ingredients a nice, even melt on all sides. Next, using a pizza cutter, slice it up into wedges. 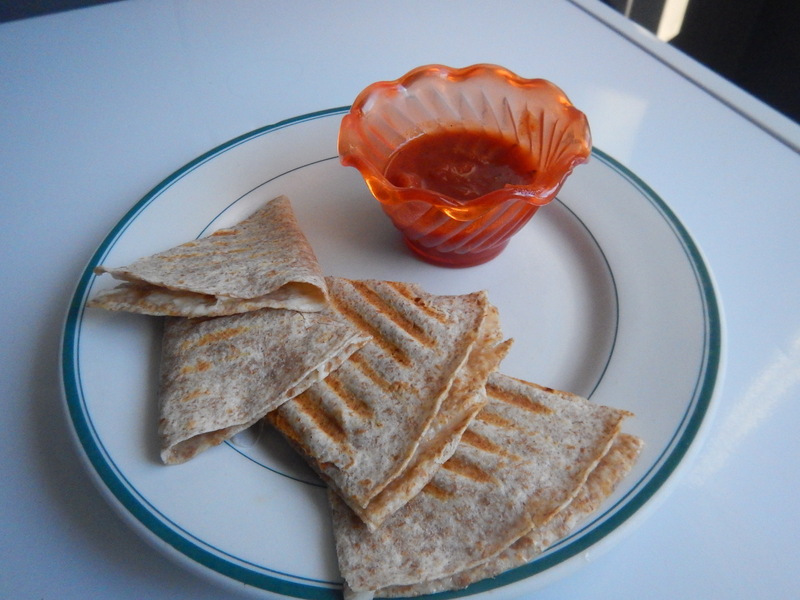 Serve the quesadilla with a side of marinara sauce for dipping, and enjoy! 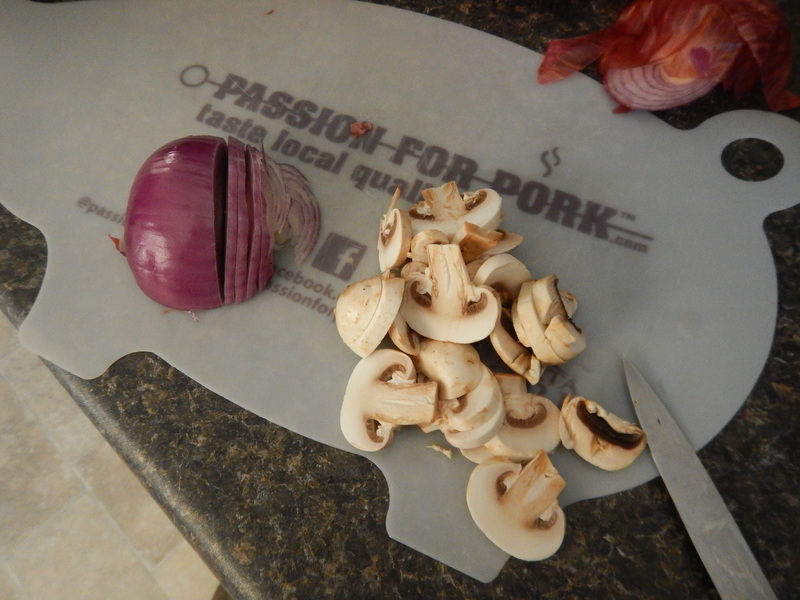 Begin by slicing your mushrooms and onion very thin. Layer your ingredients on half of the tortilla, beginning first with the cheese, then veggies, then peperoni slices, followed by more cheese. 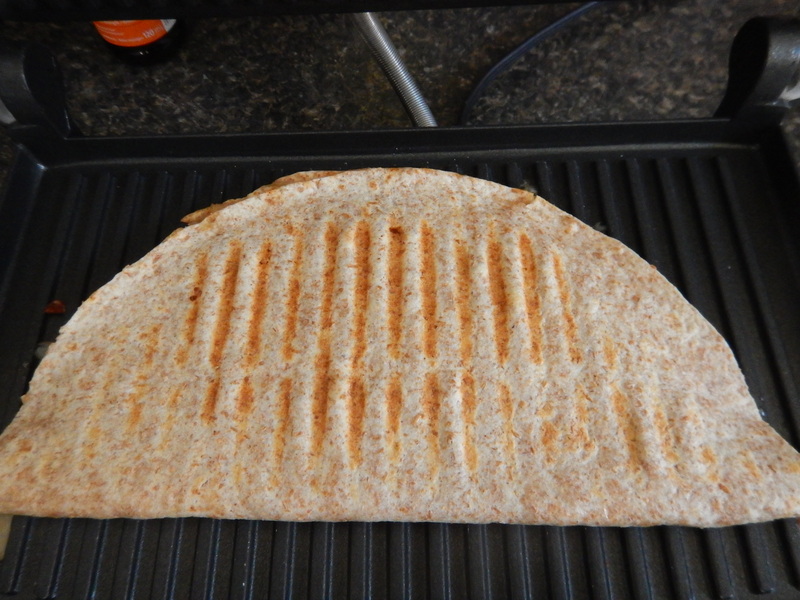 Transfer to a panini press, or hot skillet, and cook until cheese is evenly melted. Slice into wedges and serve alongside marinara sauce for dipping. 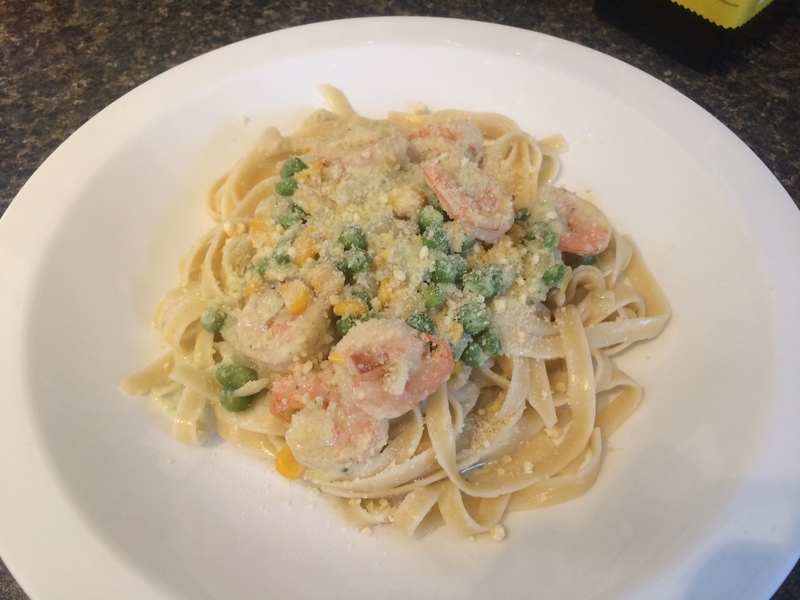 I wanted to make something a little different (and fancy) for dinner this week, so I opted for a nice pesto shrimp linguine. This one was a hit! Start off by thawing some frozen shrimp in a bowl of hot water. 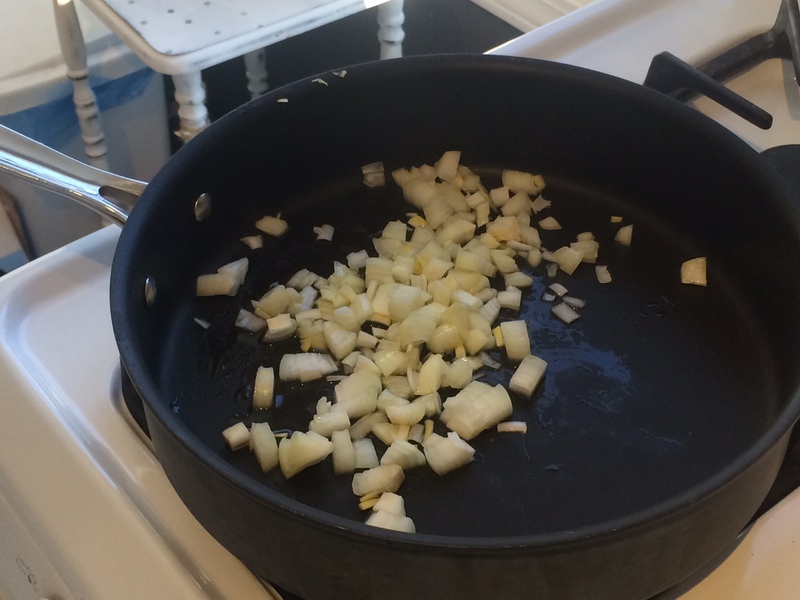 Then, dice and saute some onions in a little olive oil. 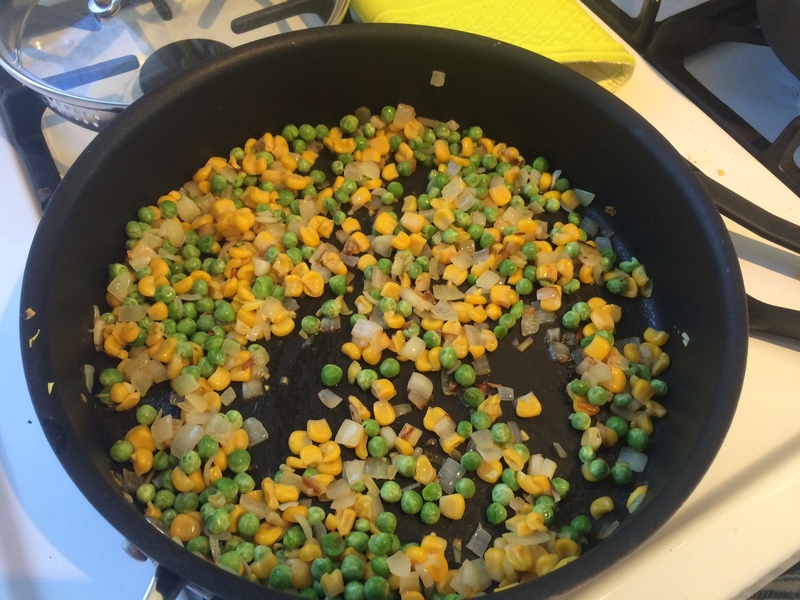 Add your peas and corn and continue to cook, on low for 2-3 mins. Add your pesto and milk, and let boil off for a few minutes, until sauce begins to thicken. When sauce is thick, add your shrimp and cook until just pink. Add to linguine and sprinkle with Parmesan cheese. enjoy! Start off by thawing your shrimp in a bowl of hot water. Once thawed, peel, removing tails and shells. Set aside. Dice onion and add to a saucepan with a a drop of olive oil. Saute on medium-low heat until slightly browned. 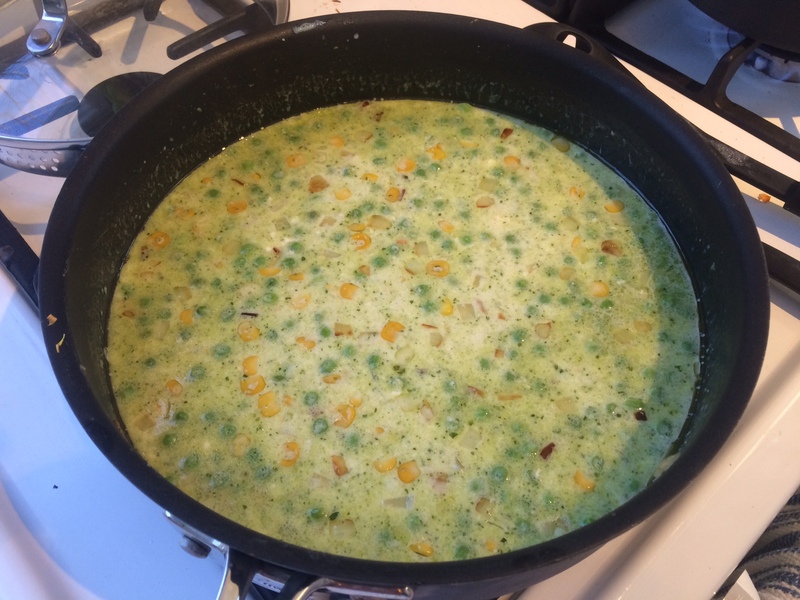 Add peas and corn and cook on low for 2-3 minutes. 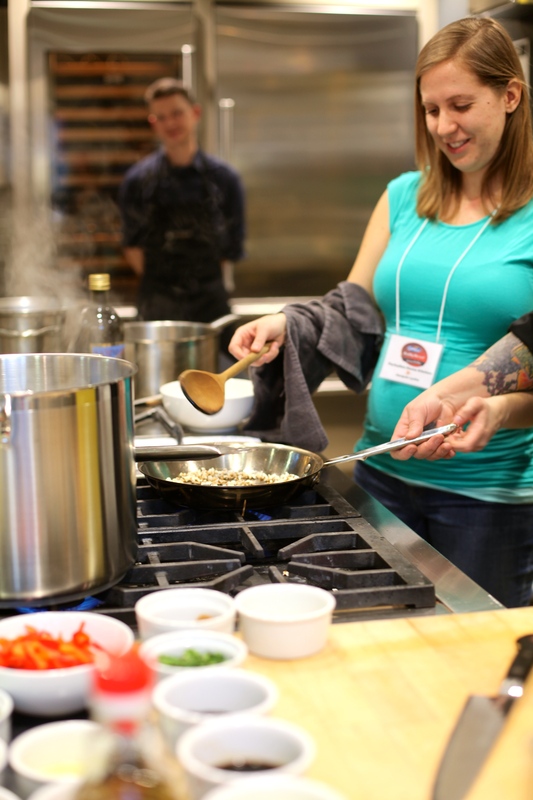 In a medium pot, start boiling your water for the pasta. Add the pesto and let melt in saucepan with onion, peas and corn before adding milk. Add your milk, and whisk until the pesto and milk are fully combined. Cook pasta according to package instructions. For the sauce, raise temperature to medium-high and let boil until sauce begins to thicken. 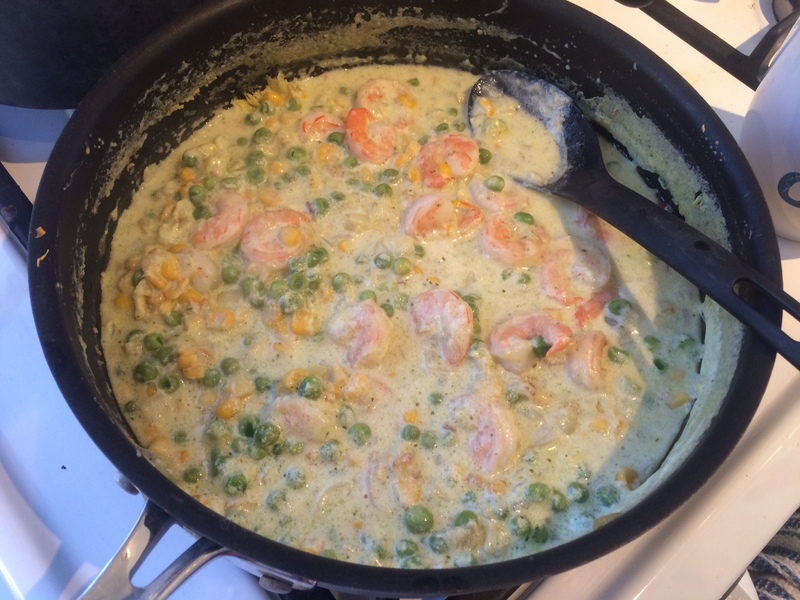 Once the sauce reaches the desired thickness, add shrimp and cook, turning once, until the shrimp is pink. Serve on top of linguine, sprinkled with Parmesan cheese. Enjoy!